A warm wind blows across me, but I still feel a chill run down my back. I'm alone in the desert. I’m at one of the darkest places on earth according to my map. It's a little scary, especially while visions of coyotes, scorpions, and roving gangs of desert hares dance in my head. I'm here to photograph monsters. It isn't my imagination. I saw them as I drove in during the day. Standing as tall as two stories, I could make out their rust-colored silhouettes against the arid sand. Fortunately for me these monsters are made of iron, sheet-metal sculptures by the artist Ricardo Breceda. Fantastical shapes depict serpents and dinosaurs. Breceda makes his home in Temecula, but due to a land/lease dispute he may soon be moving his workshop. Breceda owes his muse to an accident about ten years ago. Urged on by his small daughter, he created dinosaurs, mastodons, great eagles and more. His works are seen in worldwide locations. But Borrego Springs remains the game reserve, corralling the most metal giants in one location. While impressive in daylight, I am here to make them look like they are from another world. I specialize in Milky Way photography, so I juxtapose these monumental characters against a sky filled with stars in vibrant colors. Sky glow from nearby towns helps outline the shadowy beings. Meanwhile, I set my camera in position. A sturdy tripod, a fast, wide-angle lens, and full-frame DSLR make up my equipment. I locate the Milky Way, first with an application on my iPhone, and then visually, as my eyes adapt to the darkness. I dial in the magic formula...ISO 3200, f/2.8 30 seconds. Playing a flashlight along the weird shapes, I paint them with light during the long exposure. Light painting is an art unto itself. It requires a little practice and finesse. But after a few trial exposures, I get it dialed in. It only takes a second or two during the exposure, sweeping the light in an arc across the subject. On occasion, I use a Speedlight for a bit more contrast, often running and ducking behind the subject to backlight it. I don’t show up on the image, as long as I keep moving and no direct light falls on my body. This is no easy feat, considering it's pitch-black with rocks, and cactus threaten to draw blood. The work doesn’t stop there. The camera has captured more than what I see. The Milky Way appears as a band of white sparkly stars against the black sky. My job is to coax the color out the camera's sensor and into an expression of photographic art. I open the images in Adobe LightRoom (although any photo editing program will work). The first thing I do is brighten the overall exposure, bringing out the stars in all their glory. I open up the shadows, brightening my foreground objects, the monsters. Playing with contrast and clarity, I watch the image burst into life on the screen. I boost the colors with saturation, and now it's almost a work of art. But shooting at a high ISO comes with a price…noise. I must adjust this carefully; if I push it too far it will look overly smooth, like a watercolor painting. I know I can adjust the color noise more aggressively than the luminance noise. 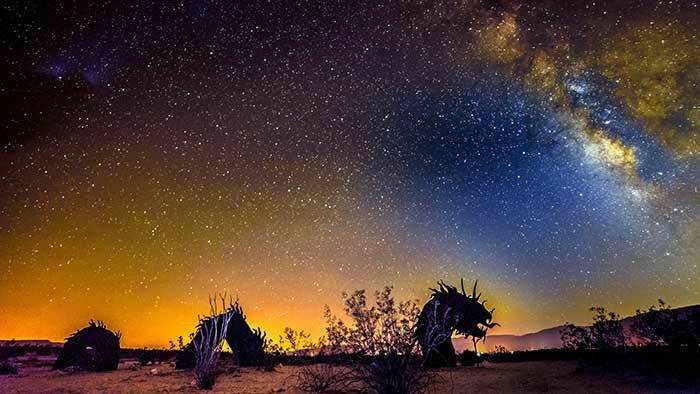 The result is seen here in the images from that night in Borrego Springs, California. 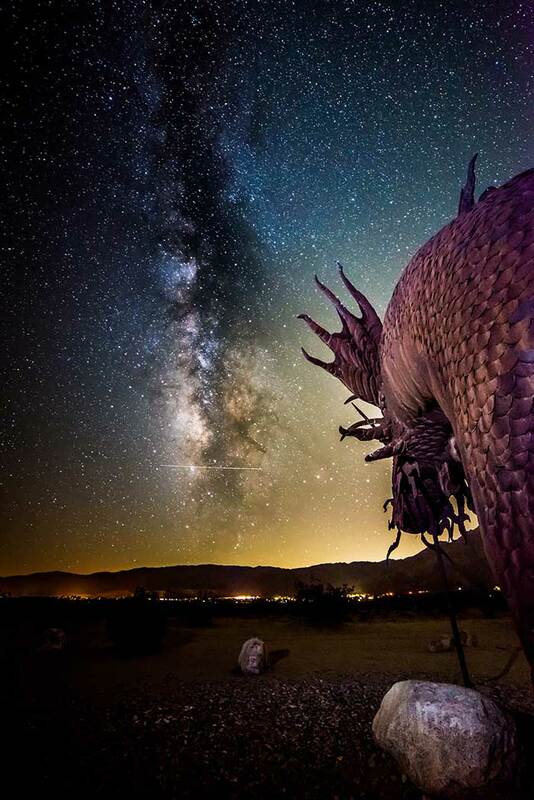 A close-up of the Serpent’s head brightened by the Milky Way. 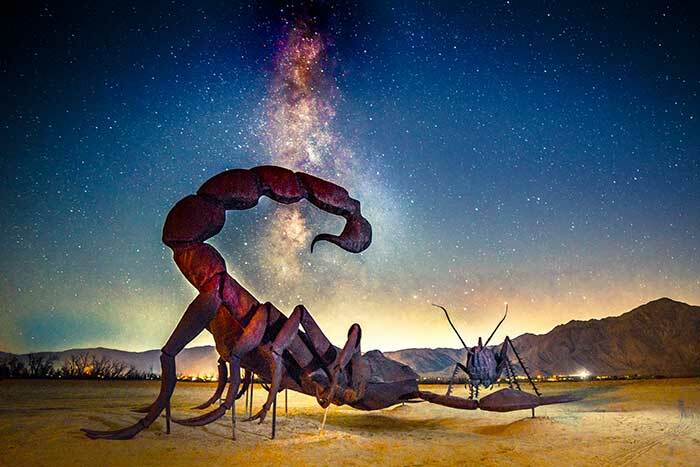 The Scorpion and Locust face off in a battle for Borrego Springs, lit by the Milky Way. 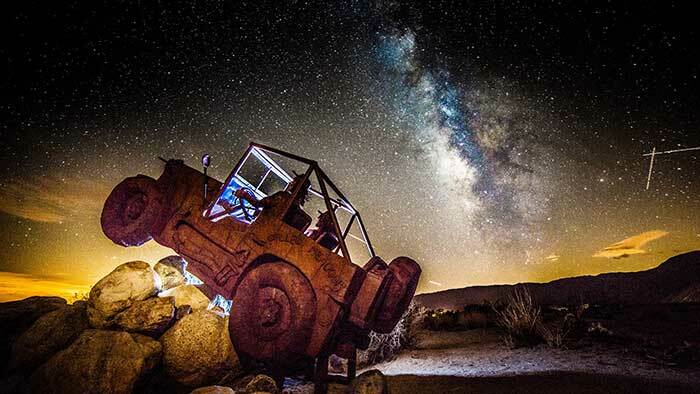 A departure from the monster theme, a jeep high-centers on a rock pile while following the Milky Way for navigation. 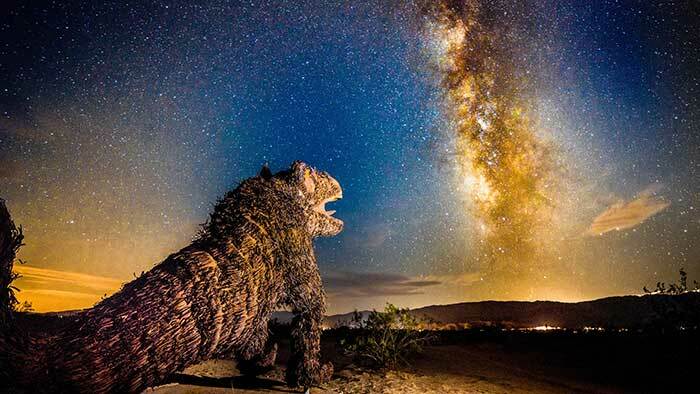 Another monster is awakened by the Milky Way hovering over Borrego Springs. Getting to Borrego Springs is easy, it's less than two hours from San Diego. It must have rained recently. I drive past stands of ocotillo, usually brown sticks, now dressed in green like proud soldiers. The mesquite and manzanita also add a splash of color to the desert with their flowers. I stop at a farm stand and get some local honey and a couple of ripe peaches. The juice drips down my chin as I leave the roadside attraction. Located halfway between the Salton Sea and Escondido, it's accessible via the 78. A short stop in the gold-mining town of Julian is in order. I pick up breakfast at the Miner’s Diner and Soda Fountain, one of the quaint eateries in town. Arriving in Borrego Springs in the daytime is important. I have to scout the sculptures. There are over 130 statues to choose from, as this prolific artist is given free rein to populate Galleta Meadows with his welded statuary. Carlee’s Place was quite literally an oasis in the desert. There wasn’t much else open. The pickups, motorcycles, and smoking locals parked outside belie the quality of food and service I find inside. A homemade gazpacho brimming with little shrimp and bright with cilantro introduces perfectly cooked grilled shrimp…in the desert! The real value of Carlee’s is the information I receive about the location of the figures. Specifically, I am looking for the Serpent, which crosses the road, and the Giant Scorpion. I had seen these images in daylight photos of Borrego Springs. I want to make them key subjects of my nighttime photos. The waiter, Chino, gives me accurate directions to both and then some. There are several hotels and villas located in Borrego Springs, but I opt for an AirBnB listing. A couple of turns into a residential neighborhood and I arrive at the house. It's a spacious three bedroom, providing much more room than I need. It's clean and comfortable and has a crystal blue pool. I decide a nap is in order since I left my home in NJ at 4 am. I have a lot of work to do at hours when I would normally be sleeping. Milky Way photography is a night owl’s beat. On any given trip, I wake up at 11:30 pm, work until 3 am, sleep until check-out at 11 am, and drive six hours to my next location. I use two iPhone apps to help visualize where the Milky Way will be when I get there in the dark. The two apps are Photopills (http://www.photopills.com/) and SkyWalk (available on iTunes Apps. Do not get version 2). These nifty applications give me the ability to see the Milky Way on my phone, align it with the foreground object, and forecast what it will look like at the time of night I will be there. Scouting during the day gives me the confidence to find the statues at night, some located a distance from the road. Even with scouting, I missed some of the subjects I was interested in photographing. Headlights don’t shine that far in the desert, and all the little sand roads look the same. I always carry a map and compass, and an electronic GPS. Cell service is not reliable in the desert. Jim DeLillo is a travel and adventure photographer who specializes in creating transporting imagery. ...Capturing local color in travel, editorial, and commercial photography. His expansive landscapes are layered, narrative, and rich in tone. They are lit from within having a luminous quality and show a strong attention to detail, composition, and production. His 35+ years of experience includes international publications including Woman’s World Magazine. His photojournalist, reality-based, eclectic style provides a refreshing break from stiffly-posed shots. Jim has recently added Milky Way photography to his skill set. Jim DeLillo is based near NYC and is available for assignments globally.